Vortigern Studies > Fectio > Articles > Who wants to be.. a Late Roman? Why are there so many re-enactors doing the second century, and barely a hundred or so doing the fourth? How does one get to be a Late Roman re-enactor anyway? Well, through a Greek Hoplite helmet obviously. Ok, that last one may have sounded a bit confusing, so I'd best start again: How does one get to be a Late Roman re-enactor? No doubt, the way to become a re-enactor of a Late Roman soldier will be different for every individual. However, none of my fellow Late Romans who I've met over the past years has confessed that they found themselves suddenly craving to read Ammianus Marcellinus, or wake up one morning to find their Gladius suddenly far too short for their taste. Apparently, it takes some time before most Late Roman re-enactors decide that this is the period they want to do. For some reason, the Late Roman period is far less popular as the second century; there are dozens and dozens of first and second-century Roman groups across the whole world, and somewhat less but still abundant Anglo-Saxon or Viking groups. In sharp contrast, only very few groups are completely devoted to the Late Roman period, which is one of those periods of time which draws very few enthusiasts. Why is that? To answer that, the better question to ask would be why the other periods are apparently so attractive to re-enactors. What is it, to stay in the Roman timeframe, that makes hundreds of men and women want to be a legionary of the second century, whereas only very few (mostly men) want to concentrate on the rest of the Roman period? This question may be answered by looking at the four A's of re-enactment; Association, Attractiveness, Audience and Availability. With this I mean how a period comes across. We have learned about the Roman Empire at school, it is well represented in books, movies, architecture, even through commercials. Almost all of these areas show the 'High' Roman Empire as the most attractive. Emperors, gladiators, shiny towns and unbeatable soldiers - this is the Roman period as we learned about, and almost no other part of the more than five centuries of Roman Rule is so well represented in our time. In other words, when we think of Rome, we think of the 2nd century. Ever seen a movie about the third-century crisis? Even the blockbuster 'Gladiator' showed the Roman Empire as it looked in its heyday. When most people think of the Romans, they see a legionary in a lorica segmentata and an Imperial Gallic (D) helmet, bearing a gladius, a pilum and a square scutum, and shod in the ubiquitous caligae. This is a very powerful image, unbeatable almost. Bright-coloured, well-armoured neat formations of clean-shaven legionaries marching to successfully defend the borders of the Empire, or bravely smash their way through scores of enemies to conquer new lands for Caesar. Again, the word 'Image' would be another word for it, I think, but this time not with the visible aspect, but with the successful aspect. Of course this 'image' has a much higher attraction-factor, as everyone will probably agree with me. Displaying any period at its finest hour has more to say for it than either the rise or fall of the Empire. I've had several discussions about this, and to my amazement I had to concede that, indeed, it seems to be common behaviour that most people want to join a group that re-enacts a successful army. Meaning they want to do something with has 'success' written all over it. Ever wondered why so few Romans do the Augustan period, which was so very successful with its enormous territorial conquests? Mainly, I think, because it is associated with the Varus defeat of 9 AD. But the second century AD, with almost no conquests other than the Dacian campaigns, has the Empire at its largest extent, which apparently in the eyes of the beholder seems much more preferable. Very closely related to the first two factors is in my opinion the audience sees the Roman Empire. What kind of Romans does the audience expect when they go to a venue? Much less bothered with knowledge, the audience is far more influenced by Association and Attractiveness than the re-enactors. To the latter's credit, of course. The common spectator, when thinking of a Roman soldier, usually expects to see a legionary in segmented armour with a square shield (don't bother them overmuch with words like 'lorica' or 'scutum'!) If not dressed according to that code, a re-enactor can be greeted with harsh disapproval - I've had several vicious comments about my Late Roman outfit and its obvious relation to the demise of the Empire. Of course, explaining it all to the audience is part of the fun, but one needs a sympathetic ear for that. The audience, to many groups anyway, is an important factor because of the money involved. Even non-commercial groups are often depending on invitations from the organisers of events, and can't afford to stray too far from what the audience wants. The material side of re-enacting is not to be dismissed. Although it is rapidly changing for the better, Late Roman hardware was very difficult to get, and re-enactors often had to rely on individual artisans/producers, rather than the second century groups, who for some time now had a wealth of material to choose from. Of course, most people like to play around with their helmets and belts when they've bought them, but that's the same for everyone. But I guess for some if not many the choice is made easier if you can buy your stuff from a lot of sources. However, availability does not only mean hardware, it also means technical knowledge. Knowing what your gear has to look like is also very important, and in this area, too, the second century has an advantage over other periods. Archaeology has revealed much more about the army of Trajan (also enormously helped by Trajan's Column) that about the army of Constantine the Great. So, the reader will by now ask, after all this moaning about why second century groups are so much more attractive, why does anyone want to be a Late Roman? I think I can say that most Late Roman groups don't just start from scratch. Some Late Roman re-enactors belong to a second century society that wants to cover the Republican period as well as the Tetrarchy. Most Late Roman re-enactors arrive at it through the Arthurian period, stretching the 'Arthurian Era' back to Late Roman times, and in fact most Late Roman groups are situated in the UK. I know of only two on the continent, one in Spain and the other in France. My own predecessors in The Netherlands have moved on into medieval times. There are also Late Romans in Germany, but no group doing that period as main theme as yet. However, even such a small number of groups and several individuals in other groups generate a common interest in contacting each other to over come the problems they're faced with. Well, when such factors as money, material and the possibility to go to events invited are not an issue, Late Roman re-enactment is very challenging. To begin with, many areas are as yet unresearched. This means a lot of work delving into all kinds of sources, to establish what material to use and how this could have looked. Luckily here, too, new publications are arriving. However, one of the differences between this period and others is that no clear standards existed in the military. No single types of shoes, neither a clear-cut uniform, nor is there one clear type of helmet for infantry or cavalry. Also, Late Roman tunics and hardware was usually much more individual, not only in shape and size, but also in matters of personal adornment. This means that we can't follow set patterns but we have to decide, with almost each part of the kit, what we want and why we want it. That may sound like too much work, but it isn't really. Following a standard pattern may be quicker, but you don't need to research any part of such a uniform. To the contrary, I find it a bonus that as not many standards have been set, there are no conventions to battle against either. No 'senior' society is dictating how the Late Roman should or should not look. No tiresome discussions about red or white tunics for our period! This practice also generates, as a logical by-product, a lot of knowledge of the period, which can be used in educating the public. Doing a lesser known period can be a blessing and a curse. A blessing because not many people know all that much about it, and a curse because there are so many misconceptions you need to address. However, even that is a blessing in disguise, because I truly think educating the audience is one of the things re-enactment is all about, and I love to do it. I can only hope that in the future, more Late Roman groups will develop as the period gains popularity. Well, for me personally, I came to this period through other interests. 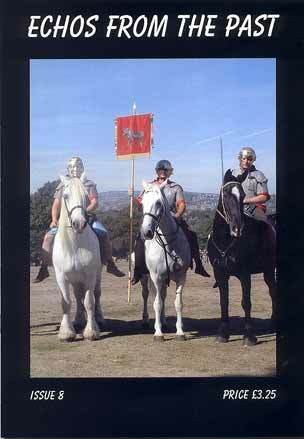 Yes, even I wanted to be a 'regular' Roman legionary when I was a kid. Somewhere on my Fectio website I have the pictures to prove it (but forgive me if I don't advertise that page, you'll have to find it for yourselves..). Of course, I too learned about Romans as the classic legionaries in segmented armour, carrying their square shield to the ends of the earth. But somewhere along the line, I developed an interest in Roman Britain, which quickly became an interest in the end of Roman rule and the Arthurian period. My main area of study for the last decade has in fact been the rule of Vortigern (425-455), a period most unfairly neglected. Through the study of the early to mid-fifth century I finally arrived at Late Roman re-enactment. After visiting the Odijk Roman Meeting close to where I live in 1997, me and a few friends decided to begin a group of our own. Fectio is named after the local Roman Limes fortress, which originally housed a troop of Thracian horse. The name of it still lives on in the village of Vechten, only a few kilometres away. Starting up, for the reasons described above, took some time, but as of this year we have begun to attend events. We're as yet a very small group, with my good friend Andreas and myself being the core members. Both historians, we've caught the bug a long time ago, him doing RPG and me constructing websites about Vortigern and Wansdyke, an early 5th century earthwork. you guessed it, the second century AD. Hopelessly anachronistic of course, but anyway, I had a Greek kid on the block who insisted his father owned an ancient Greek hoplite helmet, and which he, just maybe, would allow us to see sometime. Of course, he was bluffing, and we never ever got to see it. But, somehow, it always stuck in my mind how great it would be to own your very own ancient helmet! As far as I can remember, that must have been the first infection with the re-enactment virus. It took me about 30 years to get a helmet anyway. Time for me to have fun with it. You can contact me at fectio@hotmail.com. Try and locate the pictures from my distant youth! For those with an interest in Vortigern and the early 5th century, there's the Vortigern Studies website at http://www.vortigernstudies.org.uk/. My Wansdyke Project 21 website at http://www.wansdyke21.org.uk focuses on this unique Late Roman or British earthwork in Wiltshire and Somerset.